My favorite squash of all time is the butternut, similar to pumpkin but totally different, it has this sweet buttery taste that just makes your mouth water. What I love most about this vegetable is that once you roast it, the natural sugars of the squash caramelize, giving it a delicious smokey sweet flavor that bursts in your mouth! The squash itself might be a little intimidating by looking at its size and how hard it is to cut but once you get through its skin and into the center core, you are done with the hard part and the next steps are just a breeze. BUT I do have to say, when handling this vegetable, use gloves because its orange coloring will get on your skin and create this film that takes a while to come off, which is very annoying. Serve these as a side, on your salad or just sprinkle some salt on top and have them by itself! 2. Combine all of the ingredients in a bowl. 3. 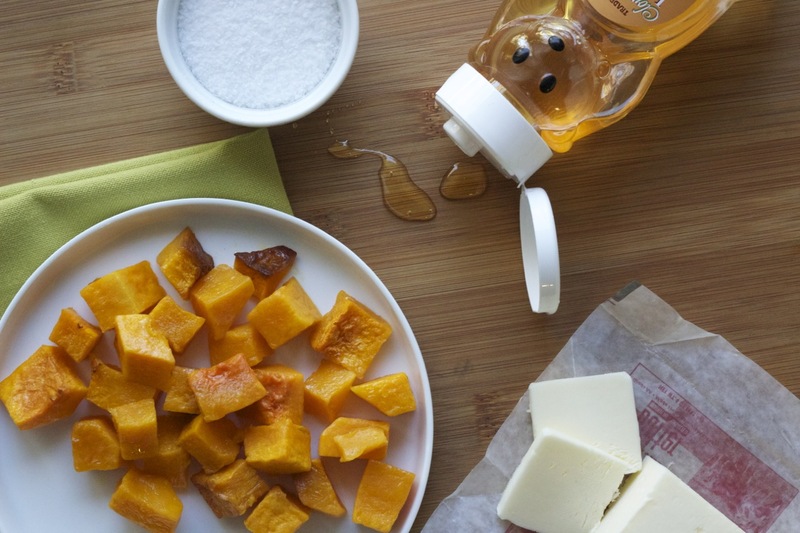 Place the cubed butternut squash on a foil-lined baking sheet. *You can also buy store bought pre-cut butternut squash for this recipe. You may have to cook it longer if the cubes are bigger in size. **Roasting : A method of cooking protein or vegetables that involves dry heat and uncovered ingredients. For example, the oven.